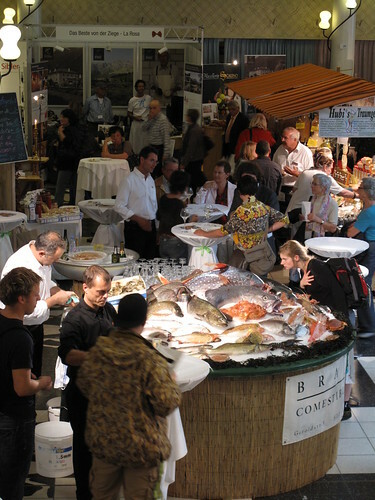 If you are familiar with New York City’s and San Francisco’s Fancy Food Show or Paris’ Salon Saveurs, then you can may have a pretty good idea of what Zurich’s Gourmesse is like. 130 exhibitors fill two floors of the city’s Kongresshaus – stand upon stand with gourmet treats to taste, passionate people behind them, all willing to answer your questions (if you speak German or Italian, that is). Each year a country and Swiss canton are highlighted. 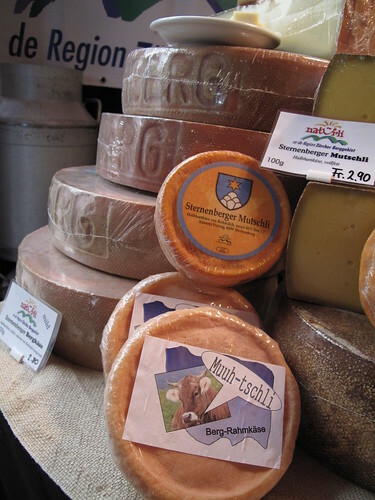 2009 (the show’s 15th year) is all about Italy and the canton Thurgau. You’ll leave with a big bag of brochures and a tummy filled with tastes of cheeses, sausages, chocolates, savory spreads and plenty of wine, plus bags of fresh pasta to make for dinner. If you’re in Zürich this weekend (the show’s last day is Monday, October 12th), put aside a few hours to simply roam the floors, and be sure to check the day’s schedule. 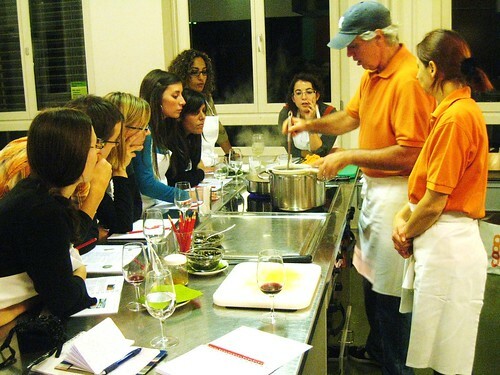 There are lectures, workshops and cooking demonstrations by an impressive list of chefs and food personalities. I made sure not to miss Rolf Mürner (below) of Swiss Pastry Design, knowing that he’d be creating an absolute beauty of a dessert plate. I was not disappointed. All sorts of interesting techniques and ingredients were explained… if only my German were better to catch all the details. Still fascinating to watch though – and taste! You’ll see his composed dessert below and that funky pail of liquid nitrogen that made for quite a spectacle. 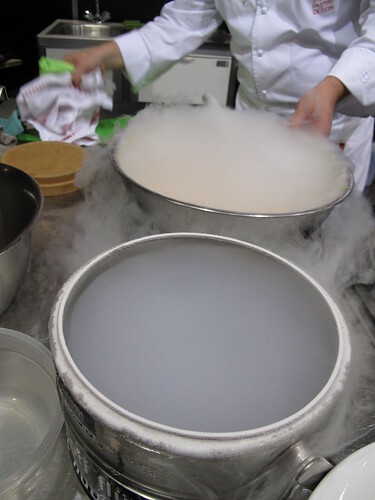 Fans of Wylie Dufresne (of wd~50) or Heston Blumenthal (of The Fat Duck) will be familiar with the technique of using liquid nitrogen (at around -300 degrees Fahrenheit!) to create frozen desserts – it’s so cold that when in contact with air, it turns to gas. It looks more like a witch’s brew under a spell. Whisked with a fruit purée, the end result is… ice cream. I’ll share a handful of my highlights from the show below, but there is one above all others that caught my eye. 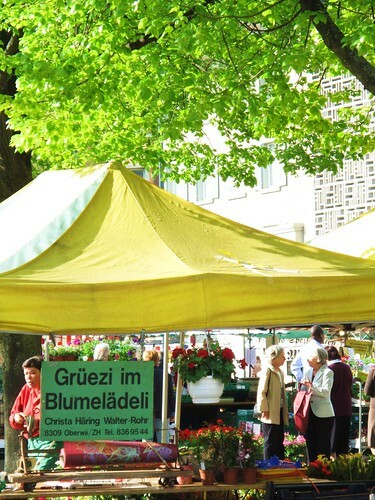 There it was, on a big sign behind this particular stand, the word just jumped out at me: GUGELHUPF! 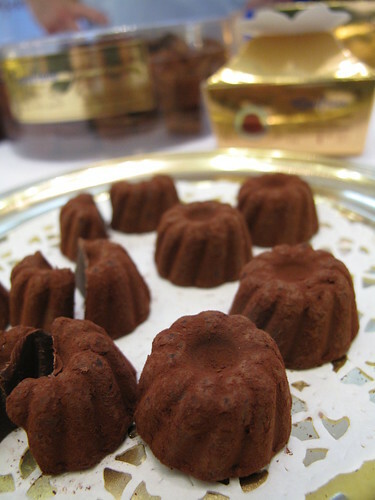 Mini chocolates in the shape of a kugelhopf – now this was for me. 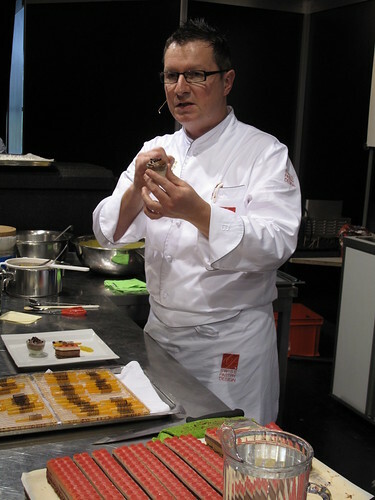 I stopped to chat with the chocolate maker, Michael Keller, whose mother is from Saint-Louis in Alsace. I asked him how he got the idea for his Goufrais chocolates, even if it seemed pretty obvious. 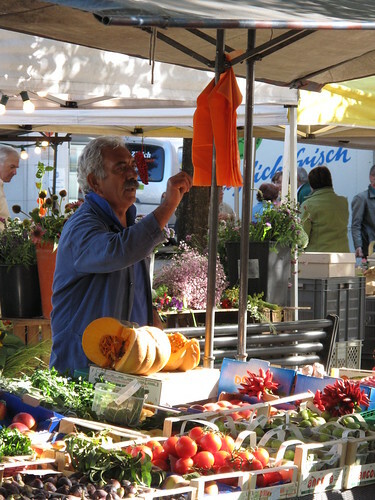 He grew up with the traditional kugelhopf cake, his mother and grandmother always having one on the table. He started making the chocolates 16 years ago, and they are still his only product. When it’s that good (and cute! ), I suppose you don’t need to diversify. So what is the Goufrais after all? It’s a delicate milk chocolate ganache, dipped in cocoa powder. The key is to serve it cool – really makes it stand out from other truffles. 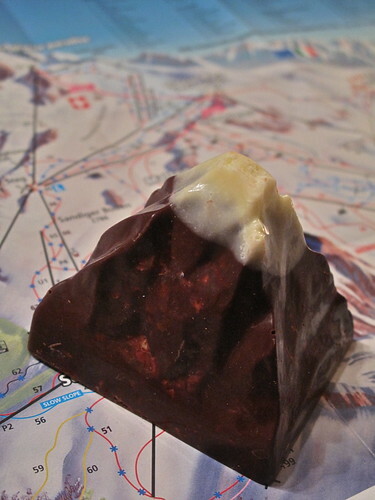 A refreshing and light chocolate that takes longer to melt in the mouth. 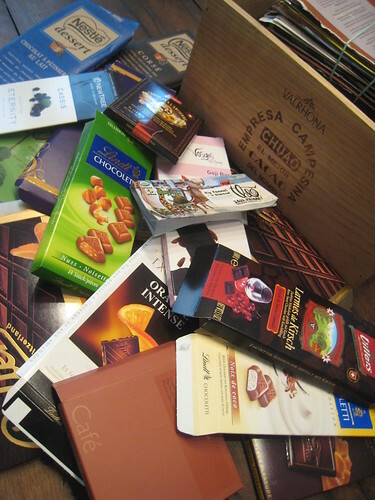 You can order the chocolates online, or Michael let me know they are available at several shops around Zürich and Stäfa. I have yet to see them, but when I do, I’ll let you know where for sure. A must try. If you go to the show this weekend, let Michael know I sent you! As for my other favorite tastes and discoveries of the day, that would include creamy and refreshing gelato from Giolito. 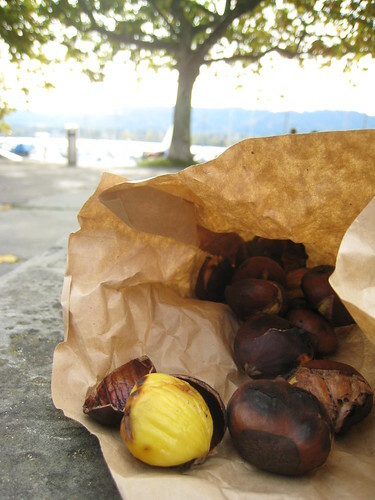 I was already a big fan, and have added another favorite flavor to my list: the seasonal Castagna (chestnut), available now through Christmas. Worth searching for. (I love their stracciatella and caffè too). Keeping with the gelato theme, you can get a special preview of Mövenpick’s latest addition to their already impressive range of ice creams. The new flavor, Croccantino Ticinese, will be available on October 24th and is going to test my loyalty to Espresso Croquant! The key ingredient is Farina Bóna, a flour from the Onsernone Valley in the canton of Ticino, made by grinding toasted corn. The flour’s aroma is outrageous – popcorn with a hint of peanut butter. This is one flour I’d love to experiment with in cookies and cakes for sure. 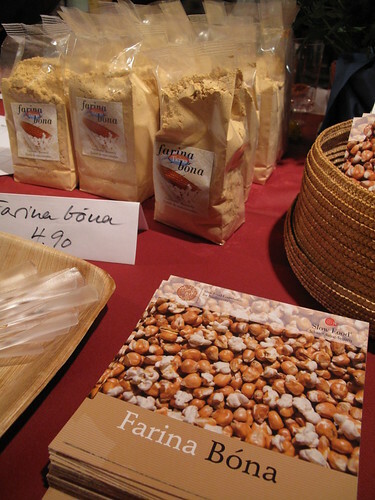 The lady at the stand recommended using 2 cups of regular flour to 1 cup of this toasted corn flour. 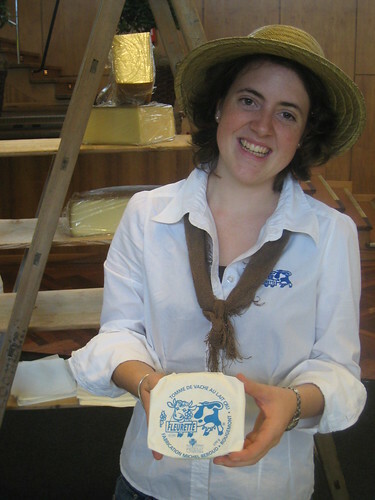 Seeing the massive selection of Swiss and Italian cheeses at the show, I’ll have to mention my favorite of them all. That would be Fleurette – and not just for its adorable blue and white packaging that I fell in love with when I first discovered it in its home of Rougemont. It is a mild, yet flavorful, ultra-creamy and unctuous cheese, a Tomme de vache au lait cru (raw cow’s milk). 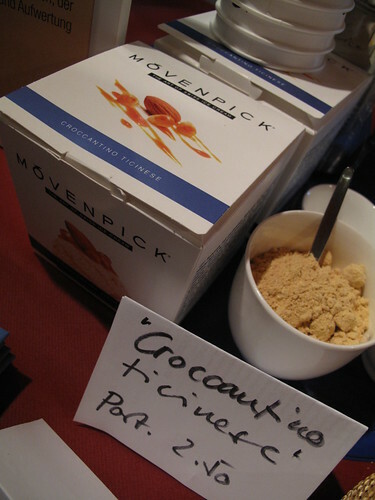 I adore it with a good crisp baguette crust and soft, dried figs. Olivier loves it with no accompaniment at all. The very friendly Agnes is manning that stand at Gourmesse – you can’t miss her and her straw hat, standing beneath enormous cow bells! Say hello from me as well. 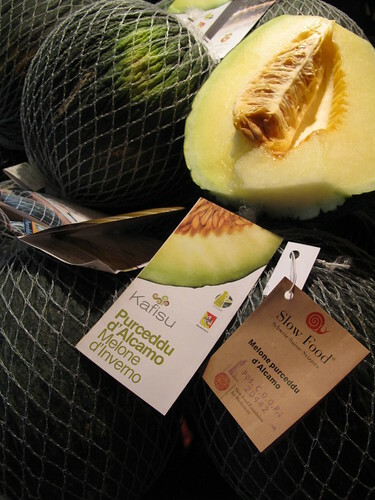 Lastly, check out the British Cheese Centre’s impressive selection, taste Presidio Slow Food’s array of exotic looking fruits and play with Sibler’s funky, modern kitchen tools. 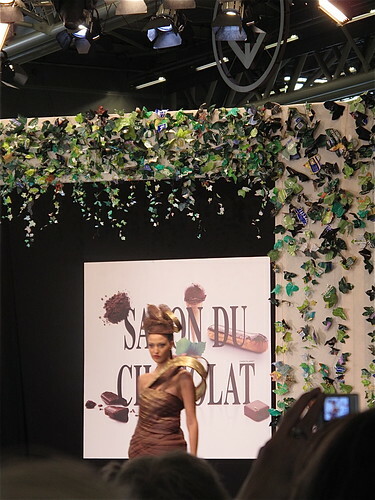 Paris’ Salon du Chocolat! Even though I’d love to be here for the opening of Zürich’s Ladurée on October 14th, Porte de Versailles in Paris is where you’ll find me. Click here for a roundup of my favorites from last year’s salon. If you’re on the other side of the Atlantic, mark your calendars for New York’s Chocolate Show, which begins on October 30th. 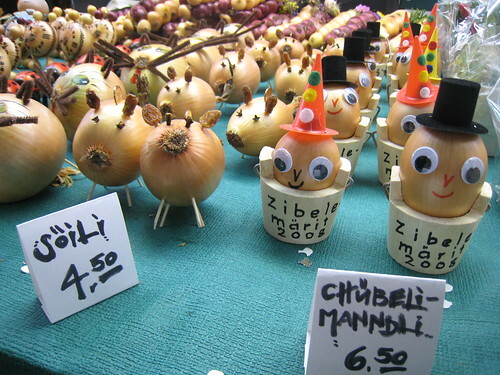 A food show for every taste and every city! I love the title of this post. But i’m so upset. 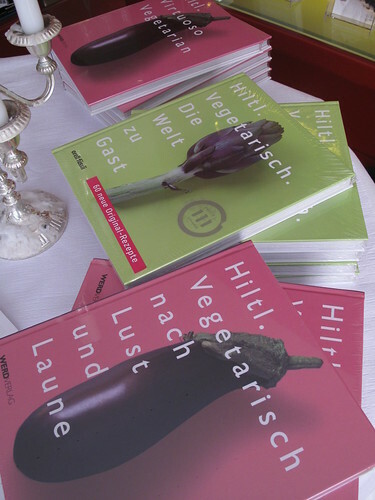 I’ll be in Zurich, but will just miss the event, and as VeggieGirl said, it’s all so fascinating (yes, especially the nitrogen to ice cream). Great pix too. 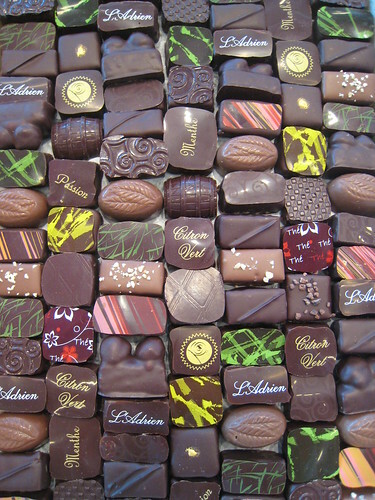 Can’t wait to hear about Paris’ Chocolate Show- oh, excuuuuse me – Salon du Chocolat 🙂 Travel safe. I just love that you found your Gugelhupf! I am sure that you sampled quite a few! How fabulous! The nitrogen gases are perfect for Halloween! I hope that it tasted as good as it was fascinating to see. 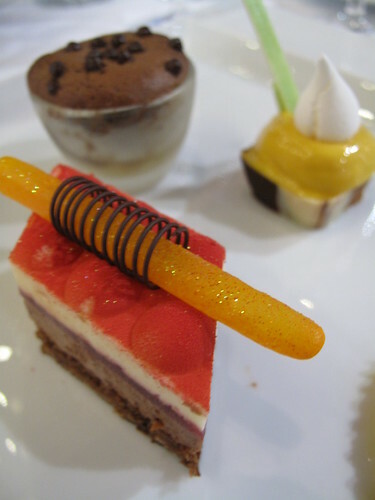 I am sure that you sampled all the items that had any sugar in it….and now on to the Chocolate Show in Paris. I do remember being there years ago and it was so much fun and fattening!!!! But extremely fun!!! 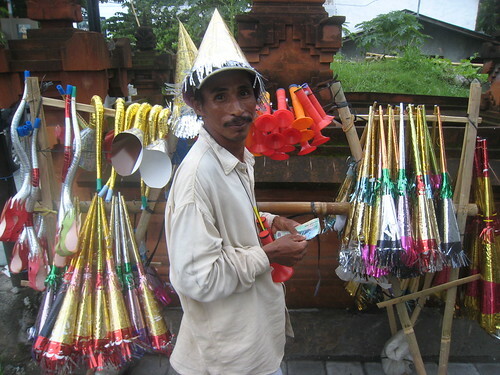 Have a great time!!!! Sounds like a good enough reason to learn German… 🙂 Seriously, I’ll flag it for next year! Jen, I definitely thought of you while in Paris – how you to love those beautiful macarons and sweets like I do! One day, we’ll have to do Paris together. 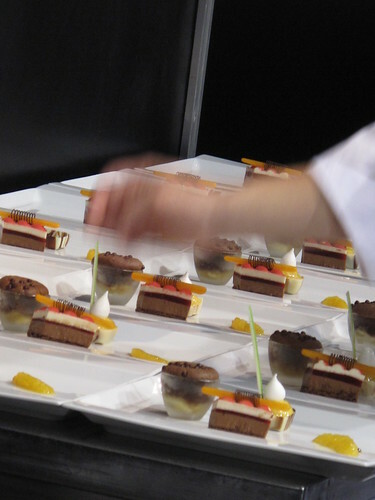 And make sure that includes the Salon du Chocolat too! The show was incredible this year once again – the report is on its way… stay tuned! Did you get the recipe?